What’s so great about the Great Wall? | Oh, the Places We See . 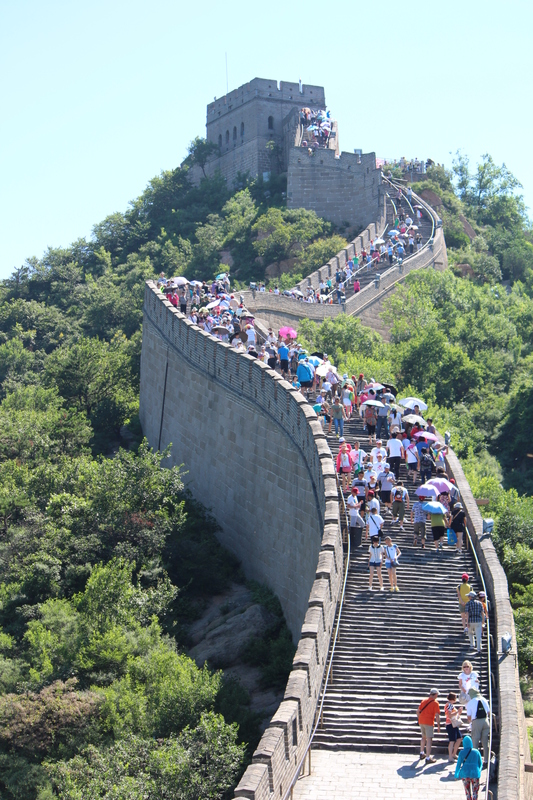 . .
People from all over the world visit the Great Wall of China. It’s probably on the bucket list of everyone who has ever dreamed of visiting China. After all, it’s listed in the World Cultural Heritage Directory by UNESCO and named one of the New Seven Wonders of the World. 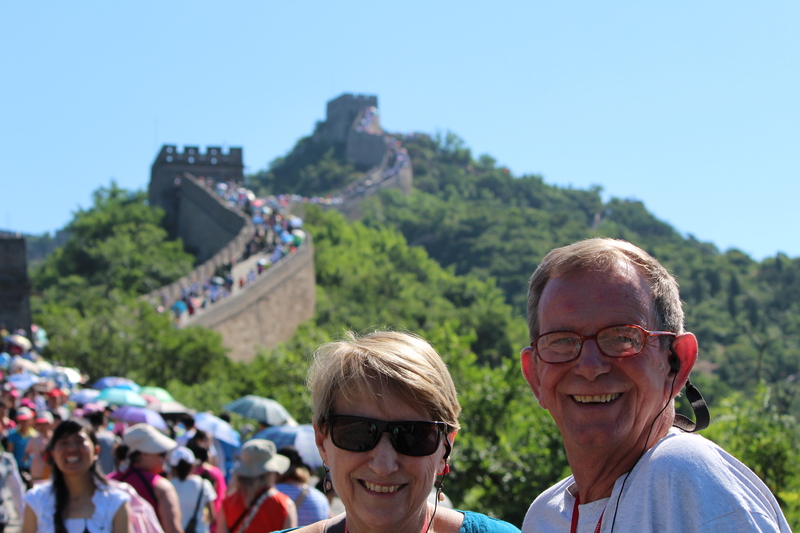 So, of course, the Great Wall was on our bucket list, too. We wanted to see it, climb it, photograph it, and experience “The Wall” just like everyone else. The tour guide on our Viking River Cruise didn’t even need to build it up for our travel group as we rode the bus to our destination. Excitement mounted on its own as we caught glimpses of towers and portions of the wall on our one-hour drive out of Beijing to Badaling, one of the restored — and most visited — sections of the Great Wall. But he did give us some background along the way. The Great Wall stretches approximately 5500 miles and almost six meters (20 feet) wide to accommodate five horses galloping abreast. Originally built to withstand attacks from Mongolian marauders, the Great Wall consists of snaking walkways made of layers of rammed earth, stone, and brick interrupted by strategically placed watchtowers. 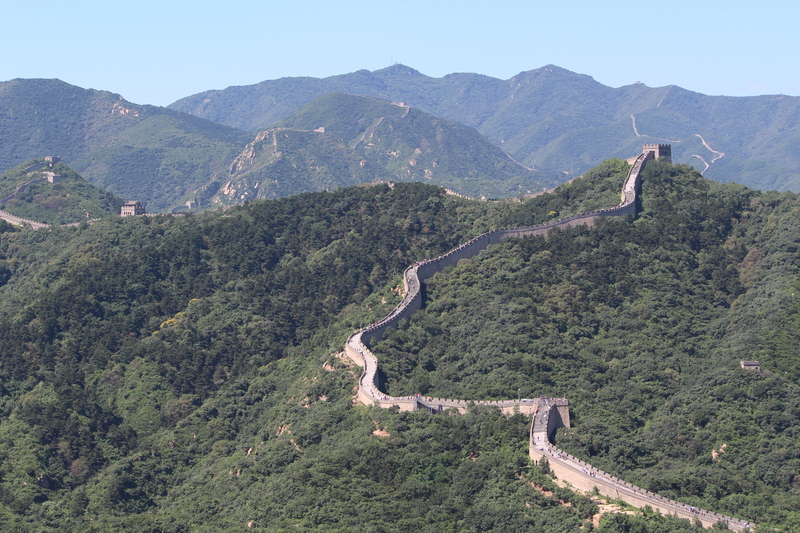 The actual building of the wall spanned nearly 2,000 years from the Warring States Period (476 BC – 221 BC) to the Ming Dynasty (1368 – 1644). 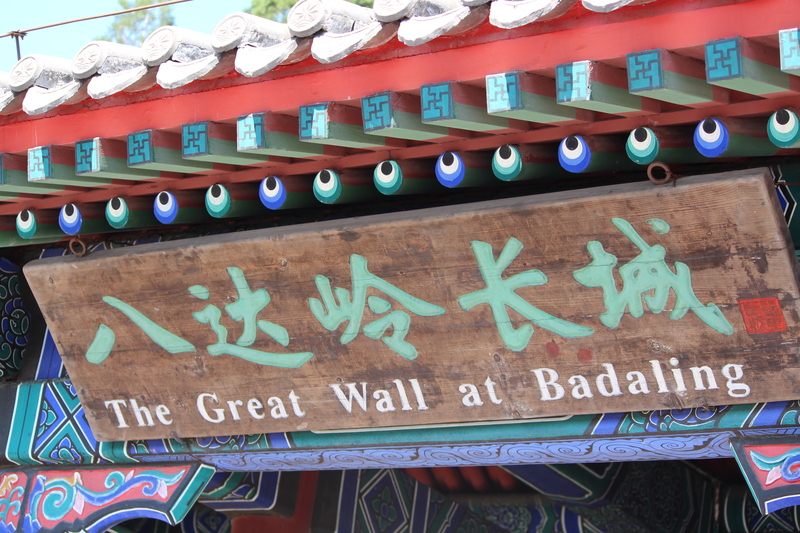 Since Badaling is known as the most visited section, we knew there would be others stepping, hiking, sweating, and arduously pushing onward right alongside of us. Most groups gathered in the plaza area surrounded by stalls and shops to take a group photo before the climb. We did, too. And then we were off. 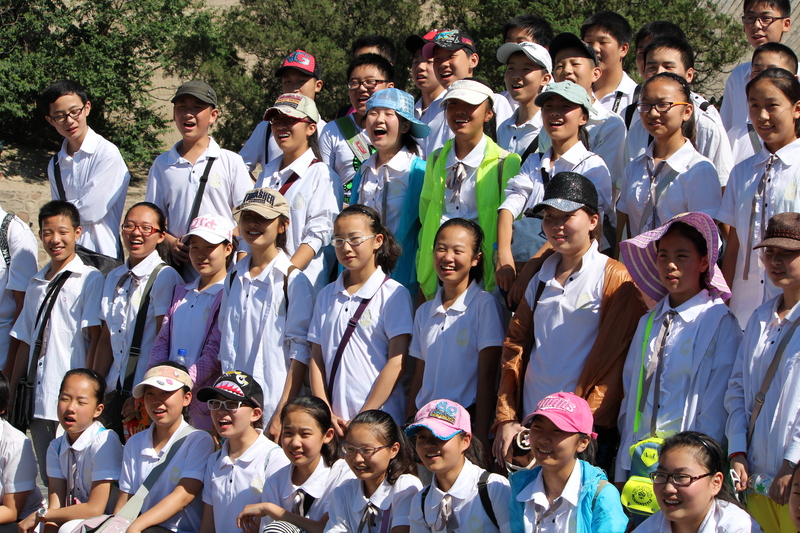 A tour group pauses before hiking The Great Wall for a picture to capture the moment. I made it! Look to your right — third tower at the top! The Chinese have made this section at Badaling a bit more tourist-friendly with the addition of hand rails and mounted lights that (I suppose but can’t confirm) make the wall even more outstanding at twilight. Steep stairs are made easier to negotiate with the addition of hand rails and, when needed, mounted lights on the sides of the wall. Bert and I climbed, paused to catch our breath, took pictures, and watched the people who came in droves. Some as families. Some as couples or singles. And several even wanted to have their picture taken with us!! With breathtaking views of the countryside, we marveled at the expanse of the wall as well as the construction — brick by brick, piece by piece with an estimated toll of possibly a million who lost their lives during the construction. It’s the enormity of this project and the link to the past that lures us all to see the Great Wall. And for some of the people (according to our guide), a climb up the wall is akin to a religious pilgrimage of sorts. I believe that — based on the smiles and the pointing and the hallelujahs heard and seen! So, what’s so great about the Great Wall? As astronaut Neil Armstrong remarked, the Great Wall is one of the few construction projects you can see from space — a testament to its size, unique purpose, and the people who gave their all to build, defend, and restore it. It’s great all right. And we hope you get to experience it, too. If you’ve been to the Great Wall, post your impressions in the comments below. We’d love to hear from you! 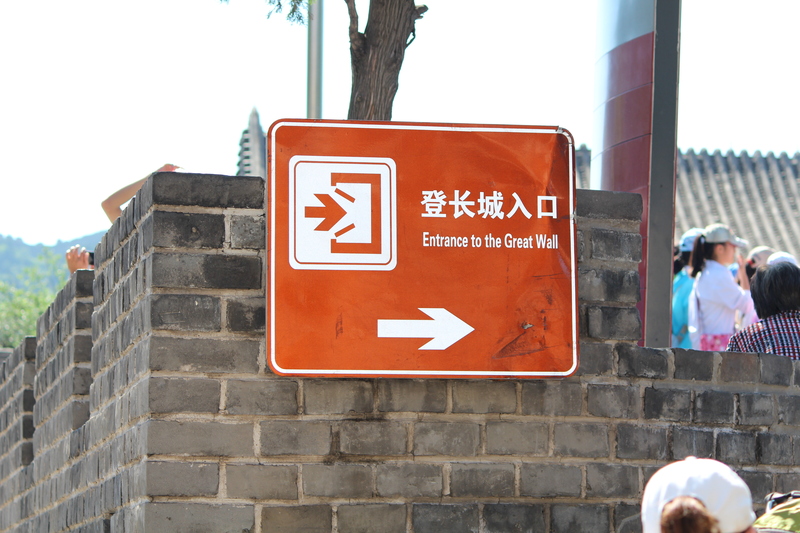 And if you want to see the people we saw, come back for our next post: What’s so great about the Great Wall (Part II)? Thanks for reading! The people of The Wall were perhaps the second best part of the trip! 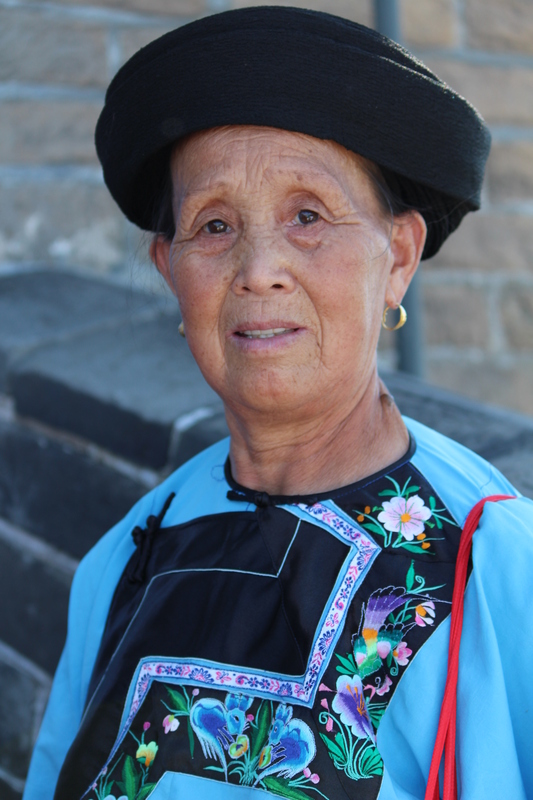 Click here to see more posts on China or go to the tab labeled China at the top of this page. This entry was posted in Travel and tagged Badaling, Beijing, China, Great Wall of China, Ming Dynasty, Neil Armstrong, Viking River Cruise: Imperial Jewels of China. Bookmark the permalink. 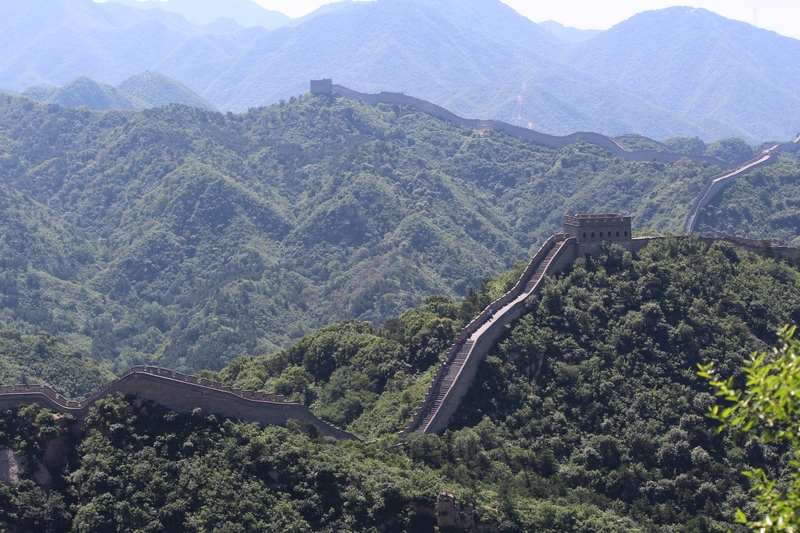 14 Responses to What’s so great about the Great Wall? Wonderful blog and great pictures! I really want to go there some day! Leni, it was an experience we will never forget. Such a testament to the thousands who worked to complete it or stood in the cold/heat to guard their country. An amazing structure. Thanks for commenting. Glad to hear from you. We were there last year July. Was an amazing experience walking around on top of the wall but wouldnt have made it if it wasnt for the cable car ride up and down. Oh, my. I wish we had had a cable car! The climb was steep! We were there in May, it was a very challenging climb, much more than I expected… Great shots! It was steeper than I thought it would be. Thank goodness for the handrails! Hi Rusha, Great article. It makes me want to go to China. I would never have thought of taking a river cruise to see China. Did you find that you had enough time on land to see the things you wanted to see? I may consider this. Thanks for the information and inspiration! Thanks so much for stopping by and commenting. The answer to your question is “never enough time anywhere”! Tours have agendas, of course, and we had to get to the bus in time, to lunch in time, to the entrance to something in time, etc. However, I’m grateful I saw as much as we did in the limited time because of the scheduling. I could have dawdled endlessly in many of the museums and tourist venues!! Any way you go will be a good thing. China is wonderful! 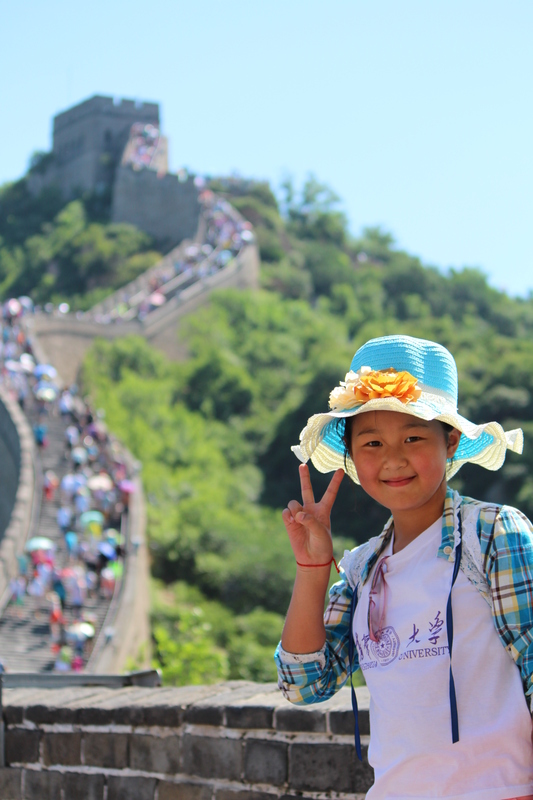 Lovely photo of the young girl at the end with peace on her mind and education in her future (Tsinghua University t-shirt). I loved so many of the people I met on the Great Wall! We really didn’t talk, but we took pictures of each other. 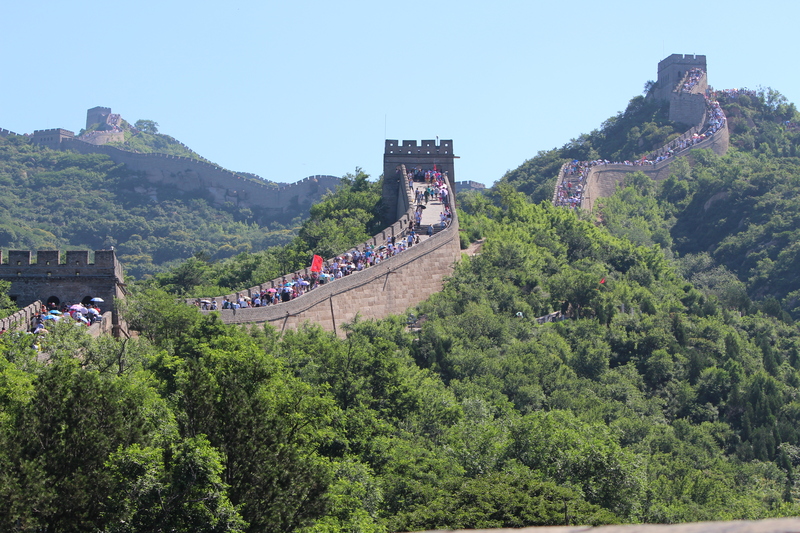 Be sure to check back for my next China blog on the people I met on the Wall! I would really love to see TheGreat Wall! And I’ve that Viking River Cruises would be great. Did you like it? My husband likes to plan and be on his own. I just think we are at an age that it sounds easier! Namaste. . . Thanks for the follow! Love to see Namaste. We were in Nepal for about 2 weeks building Habitat houses, and we said that about 20 times per day! Sounds good. We really loved the cruise. We are tourists who love being alone and on our own time. But China was a country with unfamiliar transportation and language. So, we appreciated all that our guides, drivers, and cooks did to help us enjoy the scenery without the worry. Both ways are good to see a country. 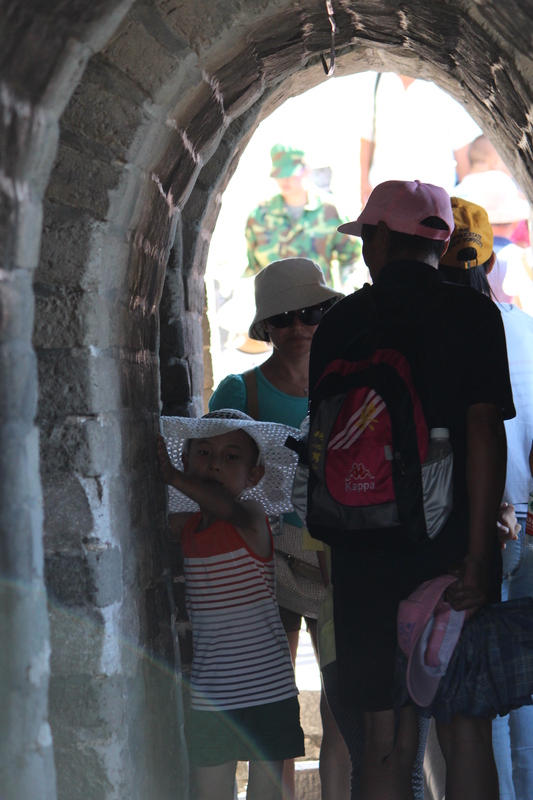 We just didn’t think we could see all that we wanted to see with guides to help us understand the history & culture. You’re welcome. And best wishes for finding your way to all of those great places!